Fifty million years ago, during the Eocene Epoch , the world had a very different climate, with temperatures much higher than today’s, especially at the poles. This hothouse climate was caused mainly by CO2 levels that were twice as high, or more, than now. On our current emissions trajectory, we could recreate the chemistry of the hothouse atmosphere before the end of this century, with potentially drastic consequences for our climate. Large ice sheets formed in Antarctica starting 34 million years ago, then, later, on Greenland —about 3 million years ago—and in North America and Northern Europe within the past million years. This climate transition was partly controlled by the movements of the Earth’s tectonic plates. The rifting and drifting continents built mountains that drew down the CO2 in the air (by means of the Weathering Thermostat, see here, section 2.4 and here after 22 minutes) and changed the configuration of the oceans, altering the way that heat was distributed around the planet. John Mason’s SkS post The End of the Hothouse has more details. The opening of the Norwegian-Greenland Sea, around 50 million years ago, ending the near-isolation of the Arctic Ocean. This terminated the Azolla phase of the Arctic, in which blooms of the freshwater fern Azolla may have been responsible for absorbing and sequestering large quantities of carbon dioxide during the Eocene. Further reading here, here and here. The North Atlantic Igneous Province, which produced basalts from Scotland to West Greenland also came to an end around 54 million years ago. These volcanic eruptions contributed considerable CO2 to the atmosphere in the Paleocene and early Eocene. The collision of India and Africa-Arabia with Eurasia, raising the Himalayas and exposing crystalline rocks to weathering. Chemical reactions between silicate minerals and CO2 gradually reduced the concentration of this gas over millions of years. The Himalayas have a long history going back far beyond the Eocene and actively continuing to this day, but the big event was the continent-on-continent collision that started around 45-55 million years ago. The opening of the Drake Passage between South America and Antarctica, as well as the northward drift of Australia; together allowing the Antarctic Circumpolar Current to form. This current keeps warm ocean water away from Antarctica and is a crucial part of the ocean conveyor system to this day. The Earth’s geography 50 million years ago. Modified from Wikipedia, to highlight (red arrows) the plate movements that influenced the changing of the Eocene hothouse into our current icehouseclimate. The change in climate after the Eocene spurred the evolution of the grasses, which adapted to the cooler climates and lower CO2 conditions over 40 million years. Grasses co-evolved with the large grazing animals. The domestication of certain species of both these grasses and grazing animals led to the invention of agriculture and the consequent explosion of civilization during the stable climate of the past 10,000 years. Thanks to the tiny bubbles frozen into ice cores, we have samples of the Earth’s atmosphere going back about 800,000 years. To look back further in time, we need to use proxies: indirect observations of characteristics of fossils and sediments that provide evidence of past CO2 concentrations. These estimates have large error bars. Different proxy methods have produced widely different estimates, sometimes by as much as a factor of ten. A recent compilation of proxy measurements over the last 65 million years by Beerling and Royer (2011) finds a much better agreement among the methods. But despite the reported improvement, a two-fold level of uncertainty remains. Modified from a figure by Beerling and Royer (2011), showing proxy CO2 estimations, deep-sea temperatures, the formation of the Antarctic ice sheet, the current CO2 level (dashed line) and the range of CO2 variation observed in the ice-age (grey bar on the right) . The unmodified figure, with original caption can be viewed here. The green annotations on the right-hand side have been added to show 2100 CO2 levels in IPCC SRES projections, ranging from the optimistic B1(ecologically friendly growth) to the pessimistic A1FI (rapid growth and reliance on fossil fuels). Beerling and Royer urge researchers to focus on calibrating their results to the last 800,000 years, a period for which we have samples of past atmospheres. While such work would probably improveconfidence in the proxies, uncertainty will remain for the proxy-measured CO2 concentrations that have much higher than modern values. 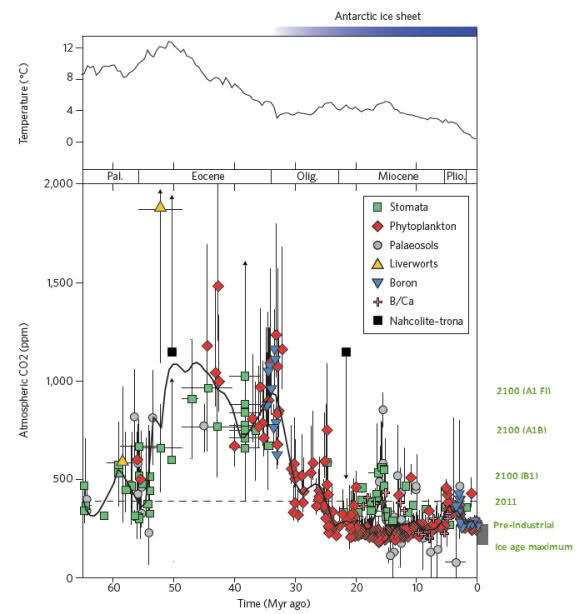 Huber and Caballero (2011) point out that some proxymeasurements in the Early Eocene are more than 2000 ppm of CO2 (e.g., Pearson and Palmer, 2000). 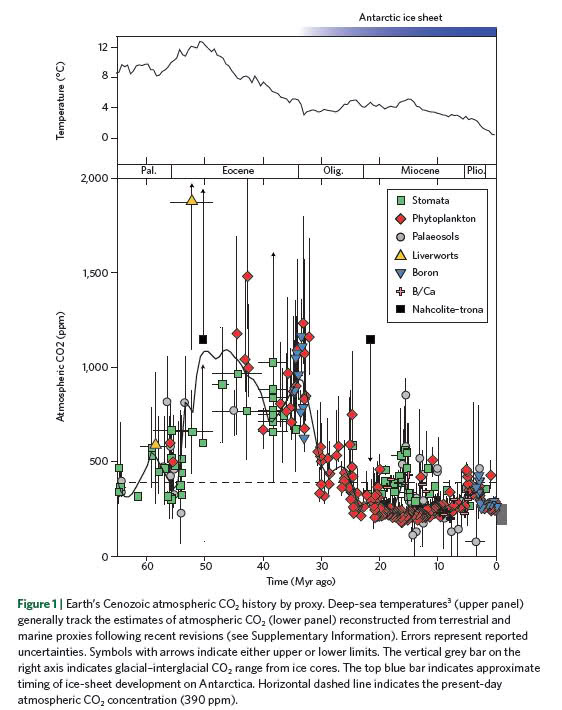 A further complication is that methane levels, for which there are no proxy estimates, may have also been high in the Eocene, contributing significantly to warming the hothouse. In a middle-of-the road IPCC scenario, A1B (rapid growth with a mix of energy sources), we could, by 2100, see CO2 levels similar to those in the late Eocene: around 700 ppm, comparable to the atmospheric conditions before the formation of the Antarctic ice sheet. In an optimistic case such as B1, which we now appear ever more unlikely to achieve without immediate emissions reductions, CO2 concentrations would rise to over 500 ppm, still exceeding anything observed in the past 30 million years. A plausible but pessimistic scenario, A1FI, would see 2100 CO2 concentrations rise to 1000 ppm, comparable to atmospheric conditions in the Early Eocene, which was the hottest time in the past 65 million years, apart perhaps from the short-lived (geologically short, that is) spike in temperatures at the Palaeocene-Eocene Thermal Maximum. Perhaps the most astonishing aspect of the change that we are currently inflicting on the atmosphereis how fast it is happening. It took 40 million years to go from 750 ppm to the pre-industrial level of 280ppm of CO2. To leap back to the Eocene atmosphere may take us just 200 years, some 200,000 times as fast. That’s roughly the same difference in speed between a snail and a jumbo jet. Of course, the climate will not fully respond to this sudden shock immediately; there is inertia in the system, fortunately. It will take many hundreds of years for the oceans to heat up and many thousands for the ice caps to melt completely. Even though it is the biggest control knob, CO2 is not the only factor governing the climate; the level of output of the sun plays a big role and many other elements, for example, the reflectivity of the surface and the redistribution of the heat throughout the Earth by ocean currents are also important. An analogy might be what happens when you turn up the furnace in a home: how hot the house gets may depend not only on the furnace setting but also on how strongly the sun is shining outside; how hot individual rooms may get will be influenced by whether or not interior doors are open and if the heat can circulate freely. Performing a great leap backwards to the Eocene atmosphere will produce all kinds of unexpected consequences. There are big uncertainties, both with the Eocene CO2 proxy measurements and with the climate models. Nobody can say for sure how events will unfold; perhaps things will be hotter, perhaps cooler, than the Eocene analogue. Maybe the new climate will be equable, with most of the extra heat at the poles; maybe it won’t. Today’s Earth is not the Eocene Earth: the oceans are plumbed together differently, the biota is changed, orbital configurations may vary slightly and there are billions of us humans who have altered the face of the land. Ecosystems and organisms will have to adapt to our new world at a pace faster than a snail’s. Moreover, the planet’s reservoirs of carbon in frozen northern soils and in rainforests as well as in gas hydrates are now charged up and, quite possibly, prone to release into the atmosphere as the climate warms. These feedback emissions would make an already bad problem even worse. Creating an outdoor Jurassic ecosystem on an island is the stuff of science fiction. Yet, our current business-as-usual policies are rapidly recreating the fundamental characteristics of the atmosphere of the Eocene. In Jurassic Park, the fictional Costa Rican air force solved the problem by blowing up the island, but that is hardly an option for us: there’s no Planet B. The Eocene Park project is not a work of fiction. The Keeling Curve has not been drawn on an Etch-A-Sketch. We are not entirely sure quite how badly our Eocene Park experiment will turn out. But, uncertainty, we must remember, is not our friend. This entry was posted in Hard Science and tagged Eocene, Paleoclimate. Bookmark the permalink.